As their beloved Black Sheep member Lucy Binger prepares to tie the knot, the close-knit group decide they need a weekend to unwind before the big day. Suzanne Cavanaugh has just the spot—her friend Amy lives in a luxury New England community on Osprey Island, renowned for its famous cliff walk and spectacular ocean views, and she would be happy to host the knitters. Knit to Kill by Anne Canadeo is the first book in A Black Sheep & Co. Mystery series (continuation of Black Sheep Knitting Mysteries). The ladies are off to enjoy four days on Osprey Island, Maine before Lucy Binger gets married. Suzanne Cavanaugh’s friend Amy has loaned them a cottage and they are looking forward to a relaxing few days. The first night, Maggie has agreed to teach a knitting class to Amy’s knitting group. They witness an argument between Dr. Julian Morton and Derek Pullman. The next morning during yoga class, they hear sirens. They find out that Dr. Morton was found dead on the rocks below the cliffs. Evidence suggests that Julian was pushed to his death. When Amy’s husband becomes Detective Dunbar’s prime suspect, the ladies discover that Julian had many enemies. Can they untangle the clues and nab the killer before the end of their weekend? Knit to Kill is technically the ninth book in the series. I recommend reading the other books in the series prior to attempting Knit to Kill. The full backstory (not even last names) of the main characters is not provided in Knit to Kill. I found the majority of the book devoted to drinking, eating, walking, biking, knitting, talking, more eating, spa treatments, and swimming. The mystery was a small portion of the story and it was unchallenging. My rating for Knit to Kill is 3 out of 5 stars. The killer’s identity can be discerned before Dr. Morton’s body is discovered below the cliffs. With a lack of action, I found that the story dragged. I wish there had more investigation and less speculation (and rehashing). There is a recipe for French toast (mentioned in the book) at the end of the book along with a shawl pattern. 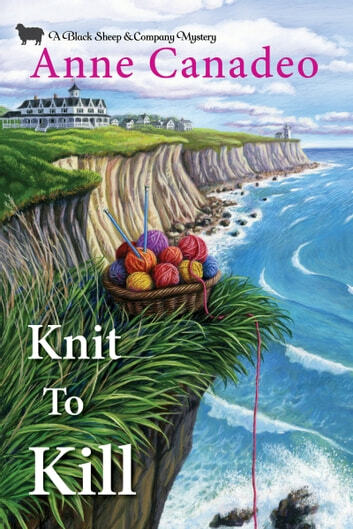 Knit to Kill is a light, breezy cozy mystery that will appeal to many readers.